At 0534 on August 31, the Beverly Fire Department responded to a report of a vehicle into a building at the area of Cabot and Bartlett Streets. Deputy Chief William Petrosino was the first on scene to find a car had left the road and driven through the corner of 83 Cabot St. Neither of the two occupants was injured. Firefighters stood by the scene until the vehicle could be removed and representatives from the city electrical, building and public works departments could assess the damage. Beverly Police and Northeast Regional Ambulance also responded. All Fire units were clear of the scene by 0642. Firefighter Hall forced his way under the hood while Firefighter Steeves used a hose line to wet down the engine compartment knocking down the fire. Throughout the incident, one lane of south bound traffic was closed to protect crews. The fire appears to have been caused by a mechanical malfunction. The operator reported hearing a pop while traveling down the highway and pulling over before a passerby advised him that his vehicle was on fire. 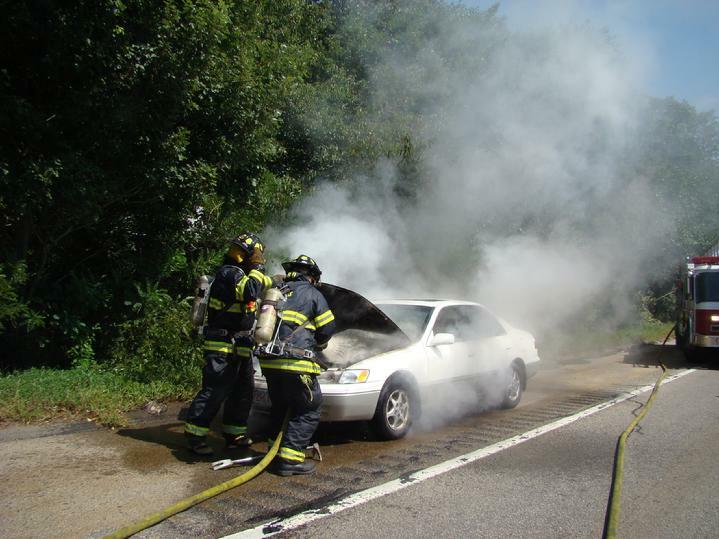 Fire damage was confined to the area in the engine compartment and the lone occupant of the vehicle was unharmed. Beverly and State Police responded to the scene and Cross Towing removed the vehicle. Fire Investigators check the scene of a fire on Country Dr. The fire was knocked down by 2305 and crews continued to overhaul the fire area to dig out hot spots until 2340. The occupants were alerted to the fire by dogs and responding police officers as there were no operational smoke detectors in the home. Neither was injured but both were displaced by the fire as gas and electric utilities to the home needed to be shut off. According to the Office of the State Fire Marshall 50% of all fire deaths occur in the 5% of homes without working smoke alarms. It is extremely important that all smoke alarms are maintained in order to provide the advanced warning they were designed to in the event of a fire. Damage was estimated to be roughly $40,000 and Fire Investigators Paul Cotter and Robert Bergeron determined the fire was most likely caused by careless disposal of smoking materials into a mulch bed next to the wooden deck attached to the home. All personnel were clear of the scene by 0027. Beverly crews at the scene were assisted by Salem, Hamilton, and Wenham Fire as well as Rehab 5 and Northeast Ambulance. Attached photo. Beverly Fire Investigator Lieutenant Robert Bergeron examines the scene looking for a point of origin. At 1258, the Beverly Fire Department received a report of a fire on a screened in porch at 11 Herrick St. Engines 1 and 5 were on the road for a maintenance detail on Sohier Rd at the time. Within one minute, Engine 1 arrived at the scene to find a light smoke condition and a person using a garden hose to extinguish the flames. Firefighters from Engine�s 1 and 5 used axes and a hose to dig out and extinguish fire that was hidden inside the walls of the structure. Deputy Chief William Walsh is investigating the cause of the fire which resulted in minor fire damage but uncovered significant structural damage to the porch. No one was displaced as there was no damage to the main body of the home. All fire personnel were clear of the scene by 1323. At 0715 on August 7, 2009, Engine 1 was dispatched to the intersection of Beckford and Elliott Streets for a report of a motorcycle accident. Upon arrival, Captain Paul Labelle and his crew found a conscious and alert motorcyclist down on the side of the road suffering severe leg trauma. Firefighters Jon Palm and Ryan Laracy worked with Labelle and Paramedics from Northeast Regional Ambulance to stabilize the patient. Two good Samaritans were assisting the man prior to the arrival of emergency responders. Due to the severity of the injuries to the victims leg, a MedFlight helicopter was called upon to transport the victim to a hospital in Boston. While Engine 1 worked at the scene, Engine 5 was dispatched to the helipad at Beverly Hospital to stand by for the incoming helicopter. Beverly Police also responded to the scene controlling traffic in the busy area as well as investigating the scene. Engine 1 was clear of the scene at 0816.